Among the many things announced by Walt Disney World yesterday, was the first new area of Downtown Disney to open as part of its transformation into Disney Springs. “The Landing” will be set by the water front and feature nationally known restauranteurs. None have been officially announced, but it’s expected to include concepts from the Patina group (Via Napoli) and Steven Schussler (T-Rex, Yak & Yeti, and Rainforest Cafe). 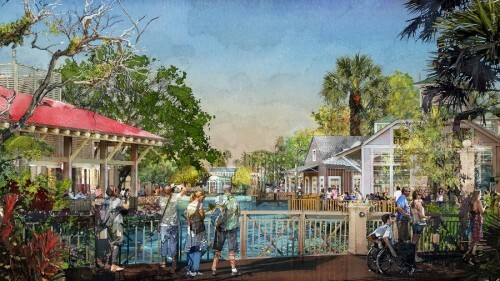 The Landing will occupy part of the area formerly known as Pleasure Island (basically behind where Raglan Road is now). Disney also released a bunch more information about the transformation of Disney Springs (which will be the official name for the area commencing with the opening of The Landing. For summer 2014, outdoor entertainment will bring Downtown Disney to life, with nine different acts scheduled nightly – more than 30 live performances daily, a free highlight of the Downtown Disney experience. Special events like Car Masters Weekend (June 14-15) puts the spotlight on classic and exotic cars for Father’s Day weekend, and includes character experiences featuring favorite Disney*Pixar “Cars” characters.